With Well of Wonders slot, once again Thunderkick have tested the boundaries of what an online slot machine looks like, and how it plays. You could try to call this a 7 reel game, with 7 paylines perhaps. But in truth, it’s something a little bit different – perhaps even more like a scratchcard than a slot. For each turn 7 symbols are revealed at once, and there are payouts for matching 3 or more. There is also a Cascading Symbols type feature whereby winning symbols are removed from the line but the others remain, and a multiplier of up to 32x for consecutive wins. In essence, Thunderkick have taken apart the traditional slot and re-constructed it in a brand new way. And this is what makes this game such great fun – there is nothing else out there like it. Well of Wonders RTP is a very respectable 96.1% and the volatility is relatively low. The game can be played on mobile, tablet and desktop. You can play this slot right now at Casumo Casino, or you can read on for more information on Well of Wonders slot. Thematically, Well of Wonders Slot is closest to Pixies of the Forest by IGT. The setting is an enchanting forest, with a well set beneath some old trees. The symbols for the game are unique stones that appear from inside the well. They all have different patterns and come in colors red, green, blue, yellow and purple. The highest value symbol is the red stone. As with all Thunderkick games, setting your stake level is very simple – just hit the casino chip in the center of the game screen and then choose from 10p to £100 per play. The ethereal background sounds and wind chimes can be toggled on and off using the volume control. The basic game is very simple – you must match between 3 and 7 symbols to create a win. Each time a win is created the matching symbols disappear to be replaced by new ones, and the win multiplier increases. This is represented by a number on the stones at the foot of the well and runs from x1 to x32. Effectively this is Cascading Reels, Re-Spins and Multipliers. But the format is very new, and very cool. Wild – Subsitutes for all other symbols to create a win. 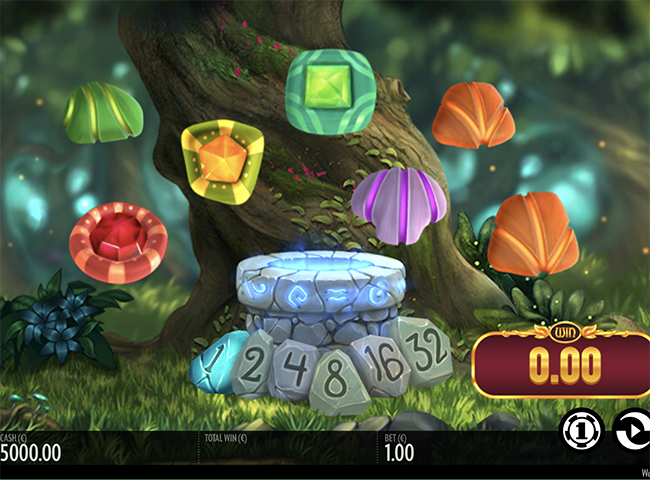 The Fairy Feature – The Fairy symbol is activated whenever it appears and there is no win. She waves her wand to remove singular symbols, increase the multiplier and set off a re-spin which can lead to more wins. The speed of gameplay in this slot may not be to everyone’s taste – it lacks the frantic action of some of the best games we know and love. However, the originality in the design and execution is very impressive, and just what we have come to expect from Thunderkick, and when you consider wins of up to 2,280x your stake on each spin, Well of Wonders slot has a lot going for it.